If it were possible to do this every time, that would be great. But let’s be realistic. How often does that actually happen? We are all only human. Oftentimes emotions get the better of us and disrupt the clarity of our judgment. When that happens in gambling, there is a dangerous phenomenon we can become subject to known as “going on tilt”. When you go on tilt, you lose emotional control. You begin compulsively making poor judgment calls. A common example is when you suffer a major loss, and then you put down huge stakes in the hopes of “winning it all back.” This of course just results in even more catastrophic losses. Everyone says to leave emotion at the door, but to some degree, we know that is not possible. Most of us do not have ice in our veins. Another common bit of advice (and I will include it here in this list) is to take a break. When that is possible, that is what I would advise. But it is not always feasible. It’s not like struggling with emotion is just something that happens to amateurs, or just something that happens for a few minutes now and again. What if you are a professional sports bettor? And what if you are having a really, really bad month? You could have just gone through a divorce, or lost a family member. That is something that is going to do a serious number on your emotions for weeks, months, or even years. You cannot simply let your professional life grind to a halt. Somehow, you need to find a way you can keep working, even though your emotions are not going to fade to the back at any point. So how can you stay productive and avoid going on tilt? Following are some concrete ideas for managing your emotions and your betting. 1. Take a short break if you can (or a longer one if you can get away with it). First of all, if you feel yourself about to go on tilt, try and take a break. There are short breaks and long breaks. Short breaks may be exactly what you need. If you can take a few weeks off and you really think you need it, go for it. But if you need to stay in the game, short breaks make a lot more sense. Betting on sports online is quite convenient in that you get to set your own schedule to some degree. You do not for example need to bet live on every match. You can sit out of certain matches if you are having a particularly hard time. In fact, sitting out of live betting altogether may be wise. Stick with bets which require longer-term planning and which give you more room to think and gain perspective. You have more time to evaluate these wagers, which means they may not be as subject to the rising and falling tides of your emotions. How can you handle the compulsive aspect of going on tilt? So do something else instead. Come up with one or several activities you can do for as long as needed—be it a few minutes or a few hours—and use those activities to replace compulsive betting. Bob works a part-time day job at an office downtown. The rest of his income comes from sports betting. He relies on both streams of revenue to make a living. If he loses either, he will be on the dole. Things have not been going well at the day job, and Bob is worried about being fired. His anxiety has been at a high pitch for weeks. When he sits down to work on his sports betting, he really struggles to keep his head clear. He battles with the compulsive urge to bet big or take wagers he should really avoid, because he is desperate to make money fast. While a lot of people might advise Bob to take a few weeks off of gambling, if he does so, he may not be able to make ends meet. Bob has discovered that exercise calms him down. It is also something easy and convenient to do at any time. Every time Bob feels the urge to go on tilt while betting, he steps back from it and exercises for a few minutes. By doing so, he teaches his brain a new habit. Eventually (it may take a few weeks or months), he learns to associate the “tilt” mentality with the urge to exercise, rather than throw his money away on bad bets. More importantly, he has learned to disrupt the default patterns in his thinking and feeling. By breaking those cycles, he takes back some control. His thinking becomes deliberate and self-directed. Is this a convenient solution? Not exactly, but it may still be the most convenient solution. 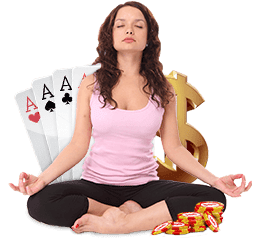 Yes, you would experience a lot of disruptions in your schedule if you used this technique, but it is better than quitting gambling altogether when you truly cannot afford it, right? Of course, if you still fall into a cycle of problem gambling, you will need to take a longer break. Hopefully, however, this method will help you avoid that contingency. If the issue is something you can resolve, tackle the problem head-on. The next recommendation I have is to make an attempt to fix whatever problems in your life are causing you all this anxiety, depression, anger, or so on. This may not always be doable, and it may not always be applicable. If you just got diagnosed with an incurable disease, obviously there is nothing you can do about that. Or if you have lifelong depression, you may be able to treat the condition to some degree, but on another level, it will always be there. But there are many situations you can influence in some way, or even resolve entirely. With Bob’s situation, for example, perhaps there is something he can do at the office to impress his superiors and improve his job security. Or he could consider quietly going on a work search to find a better, more dependable employer. In short, sometimes difficult emotions are there to give us a useful message about our lives. That message is not to take desperate, wild gambles with our sports betting, but to tackle problems which can be fixed. Practice meditation or deep breathing or another relaxation technique. When you are dealing with a ton of stress, your body goes into fight-or-flight mode. While this is a valuable survival response, it is often inappropriate in day-to-day life. Quite often, we are not in a position to fight or flee. So what we wind up with is a lot of pent-up adrenaline which has nowhere productive to go. This tends to result in a destructive force in search of an outlet—and then we get problems like panic attacks or going on tilt (or both simultaneously). There are a lot of ways to dissipate adrenaline and calm yourself down, but some of the most successful for a large number of people are relaxation techniques. Within each of these categories, there are numerous different methods you can try. There are also a slew of non-traditional techniques which may work as well. For example, right now adult coloring books are extremely popular as therapeutic relaxation aids. Many people also enjoy engaging in their hobbies. If you like working with your hands, craft or build something. If you enjoy video games, sit down with your console for a bit. Ultimately, you can come up with your own relaxation techniques based on your unique personal needs. A therapist addressing anxiety once told me that the happiest people are often those who can “lose themselves” in an activity for some period of time. The more prone you are to negative emotions and the more easily they distract you, the harder it will be for you to find those activities. But if you do, they can be a big help. If you get into a habit with relaxation techniques, you can use them in the moment when you need to regain control. You will also find that if you just do them daily, you may be more relaxed all around. I have mentioned exercises such as tai chi or yoga which are typically considered “relaxing,” but you do not have to do exercises like these to calm down. You can do any exercises you want. Some people find that just taking a walk is enough to induce relaxation. Still others might prefer something more active like weight lifting or jogging or dancing. Exercising is great because it has a couple of effects. First of all, it burns all that nervous energy. Secondly, it often helps to clear your mind. You focus on your body more, which pulls you out of your head a bit. Like relaxation techniques in general, exercise is something which can have an overall positive impact on your mood if you do it regularly. But you can also exercise in the moment when you need to burn some adrenaline. The next thing you can try to do is find a way to re-frame your thoughts, especially about negative events. This process is known in psychology as “cognitive restructuring.” It is commonly taught as part of cognitive-behavioral therapy (CBT). The goal with cognitive restructuring is to identify thoughts which are irrational, incomplete, or unhelpful. You then replace those assumptions with more realistic, helpful, objective observations. Oftentimes, the negative assumptions you have are not even entirely conscious. So it may be difficult to figure out what they are. If you identify negative and unhelpful thought patterns which crop up regularly in your thinking, it is a good idea to write them down and make a list just like this with appropriately restructured thoughts. You can then post that somewhere in plain view so you can look up at it any time you need a reminder. And you may need a lot of those. It is very rare in life to just have an epiphany and suddenly find that your entire thought structure is rearranged permanently for the better. Instead, most of us take a long time to rewire a basic underlying assumption if it ever happens at all. That is why regular reminders are so important. So take an active role in the thought restructuring process, and revisit it as often as you need to in order to keep your thoughts as rational and level as possible. Doing this can help you get your emotions in check. A lot of us have a mental image of the professional gambler as some kind of emotionless genius who can stay entirely focused and cool-headed in any circumstance. Most people are not like that. Even people with a relatively solid grip on their emotions can go through really bad times. And sometimes those times can carry on and on. To whatever degree you can leave emotion at the door, do so. And if you can afford a break, take it. But if you rely on professional sports betting to make a living, and you cannot take months out of work, you will have to find a way to stay profitable even amid your turbulent emotions. Can you do it? Maybe, maybe not—but there is a pretty solid chance that you can. Using the techniques above, you can positively restructure your thoughts, relax your body and mind, and overcome your urges to go on tilt. It may take a while before you get a handle on yourself, but once you do, you may find that you can continue to make great money betting even during the roughest periods of your life. Super Bowl 51 Round Up – Why Did the Falcons Choke?